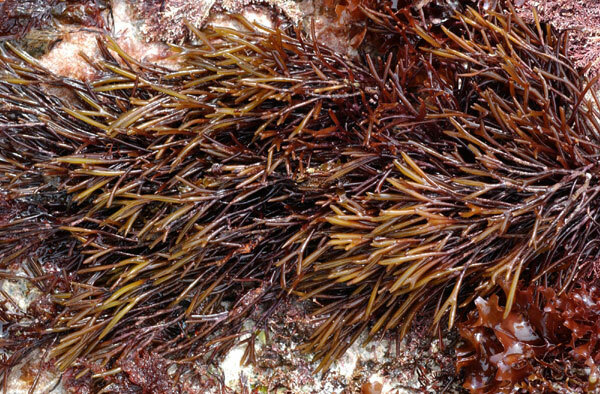 Also known as Furcellaria fastigiata and as Black Carrageen (English); Leaba Phortáin (Irish: Crab's Bed). Description: Cartilaginous, cylindrical, brownish-black fronds, repeatedly dichotomously branched with narrow axils, fastigiate, to 2 mm diam. and 300 mm long, with acute apices. Attached by much-branched rhizoids. Multiaxial, medulla of cylindrical cells interspersed with rhizoids, cortex of irregular filaments, inner cells elliptical, outer cells narrow, elongated, in radial rows. Reproductive structures are formed in pods in winter (below), which are generally shed in spring with apical growth resuming. Habitat: On rocks, lower intertidal and shallow subtidal, in pools and runnels, in open situations, often on sandy or muddy shores, tolerating lowered salinities. Widely distributed, common. Distribution: Spitsbergen south to Spain. Similar species: Polyides rotundus is similar in expternal appearance but has a discoid attachement structure instead of a rhizoidal one. Furcellaria is also brown if you hold it up against the light, whilst Polyides is red in transmitted light. 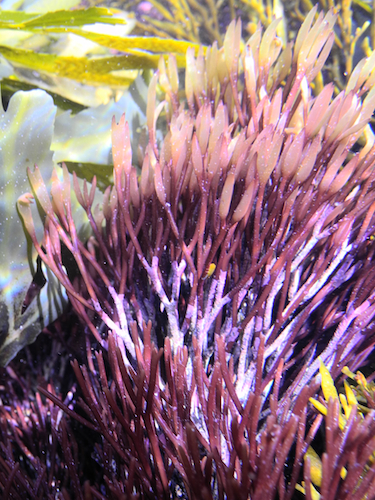 Usage: A detached form was once collected in Denmark for carrageenan (furcellaran) production but stocks are now exhausted; all carrageenan produced in Denmark now comes from foreign sources. Site © M.D. Guiry 2000 - 2019. Important copyright notice: all text, design and photographs on this site are copyrighted by M.D. Guiry unless otherwise stated and all rights are strictly reserved. Click here for copyright information and contact. Website design: 249 Design Studio. Site maintained by M.D. Guiry (michael.guiry@nuigalway.ie). There have been 8736709 page loads since 1 January 2014 on 25 April 2019.